On 26th October 2018 I posted an article about the slate quarries of North Wales, and how there were governmental moves afoot to seek Unesco World Heritage status for the region: scarred but nonetheless magnificent, testament to a destructive and all-too-brief industry. History on the doorstep, for holidaymakers at Henllys. Well, it’s become even easier to get a sense of that history, thanks to the new Snowdonia Slate Trail. Launched in November 2017 (though actually only completed in March 2018), the Trail gives walkers a taste both of how (briefly) vital slate was to the Welsh economy; and how hard life must have been for the quarrymen and their families, on the industry’s front line. 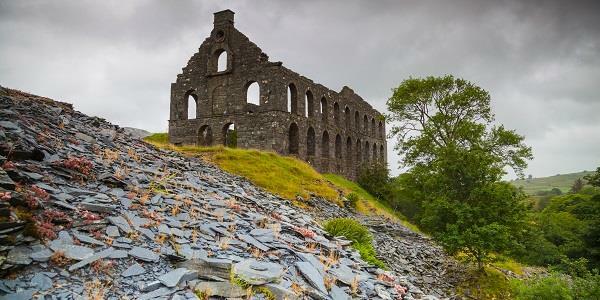 An 83-mile route, the Trail takes you on a journey back in time to when Snowdonia was the centre of the UK slate industry. Starting in Bangor and taking in Bethesda, Llanberis, Waunfawr, Nantlle, Rhyd Ddu, Beddgelert, Croesor, Tanygrisiau, Llan Festiniog, Penmachno, Betws y Coed and Capel Curig, the Trail can be walked in its entirety in seven days; or you can just choose the bits that appeal to you. The whole walk is slate-themed (obviously, given the name of the Trail), but if you’re pushed for time (or have other things to do on holiday besides walking) the two ‘stand-out’ stages are Stage 2, from Bethesda to Llanberis, and Stage 8, between Croesor and Tanygrisiau. 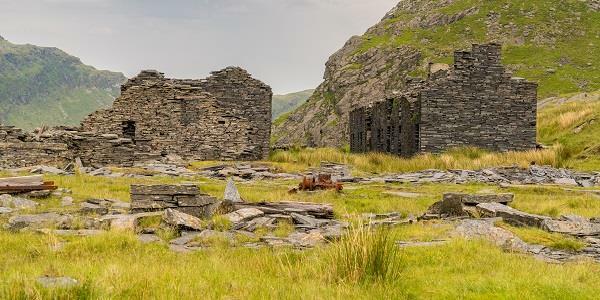 The former “takes you through the heart of the slate industry”, while the latter, “probably the wildest and most strenuous”, leads to the abandoned and incredibly evocative village and quarry of Rhosydd (below). Stand for a while. Close your eyes; and imagine how life must have been, in that beautiful but harsh environment. For full details of the Snowdonia Slate Trail, click here. To get to Bangor from Henllys, take the B5109, the A545 and then the A5; the total journey is about eight miles. To reach Bethesda (the start of Stage 2) take the same route, but leave the A5 for the Treborth Road, A487, then merge onto the A55 North Wales Expressway, then rejoin the A5 at junction 11 for Betws y Coed and continue to your destination; the journey is just over 13 miles. Croesor (the beginning of Stage 8) is 32½ miles away, via the B5109, the A545, the A5, the A487, the A4086, the A4085, the A498 and then rejoining the A4085.